The Two of Swords is a card that belongs to the fourth suit (Swords) of the fifty-six cards called Minor Arcana in a traditional seventy-eight tarot card deck. Used for both playing and divination, its suit element is air. A young blindfolded woman holding a sword in each hand is seen sitting on a flat gray stone bench. She keeps her arms crossed, pointing the swords in an upward angle. She is wearing a full-length white robe whose color matches with the cloth toed around her eyes. In the background, there is a quiet and calm sea with rocks and crags, standing as an obstacle to ships and other water vessels. A crescent moon shines in the sky right to the woman. 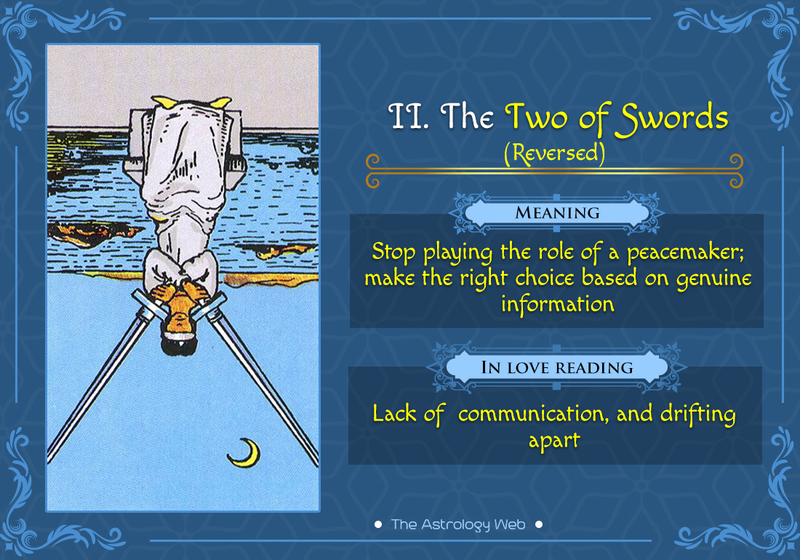 The 2 of Swords throws light on the possibility of getting too many choices in life as well as the difficulty in taking the right decisions. The blindfolded women represent the situation where finding a solution to a problem can be extremely confusing. The matching color of the robe and blindfold suggests doing something deliberately. Since the swords are held in a perfect balance, it symbolizes a sound and stable mind. In the crossed position, it indicates the necessity for peace, intellect, and logic. The crescent moon signifies a new beginning while the rocky sea stands for hurdles that could prevent one from gaining success. 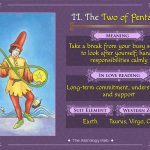 It refers to someone who is harmonious and peaceful when it comes to dealing with different relationships and situations. However, they will have difficulty thinking if anything goes out of control. They tend to compromise a lot to avoid any conflict or argument. In your, such a person will be a low profile and cool-headed friend or family member. A feeling of emotional disconnection may arise as you may consider thinking deeply about a particular matter. You won’t at first submit to any emotional feelings. At times, you might need some solitude and peace to come to a conclusion. Too much of distraction can make it tough for you to strike a balance and protect your energy. 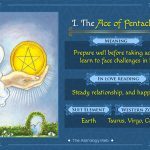 Interpretation: When the card appears in this position, it means that you are intentionally avoiding making a vital decision to maintain peace and harmony in your life. Despite avoiding the situation, you cannot stay like this for long as a decision has to be made sooner or later. The card suggests you strike an intellectual balance to think well before making a decision. Sometimes, life may bring you at a crossroad, compelling to take the toughest decision. Therefore, try to look at all the alternate solutions and give your final say. 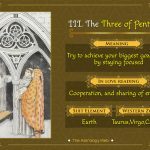 Interpretation: Those who are committed have to take a decision regarding their relationship to bring some positive improvements. 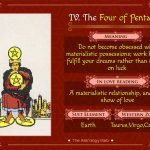 Your approach towards love should be more straightforward rather than playing safe without communicating well with your partner. If you are single, you might be showering all your attention on one person due to your unstable decision-making. Career and Work: Your coworkers or superiors may have a difference of opinions about where you have to take a strong stand. However, to avoid appearing disloyal you might not be able to provide the right support and end up ruining your image. Finance and Business: Despite have some serious monetary problems, you are in a denial mode, unwilling to accept the reality. Unless you realize it, nothing can be done to curb further losses. Health: When emotions are locked up inside, the effect will always be on the health. Without showing any resentment or expressing anxiety, you are deemed to suffer from an illness. Interpretation: In the upside-down position, the card indicates that you are trapped between two situations where disregarding any one could lead to some negative consequences. Also, you are in a state of confusion as a result of getting too much information about the choices you have. 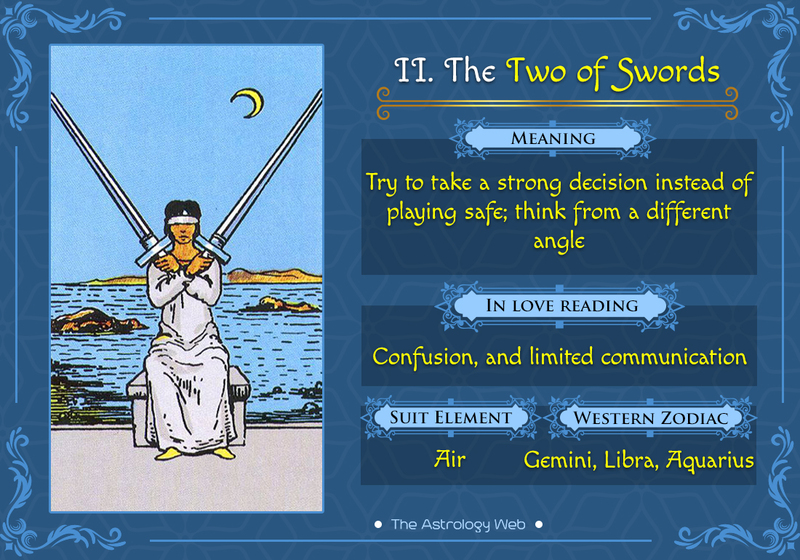 The 2 of Swords advises you to weigh the pros and cons of both the cases and then take a sane decision. Don’t exhaust yourself by playing the role of peacemaker otherwise you will be treated as a frustration by the parties concerned. Interpretation: Due to some turmoil going on in your head, you are staying at a distance from your partner rather than talking out the issues bothering you. By repairing the cracks in your relationship, you might be able to make the situation more comfortable for your partner. Career and Work: Lack of cooperation in the workplace and ongoing politics could distract you and affect your work. A project may get canceled or your promotion could be delayed, making you more anxious and tensed. To get out of it, consider taking a strong decision such a quitting the job. Finance and Business: You will finally be able to come to terms with the truth of the situation. Build a realistic approach before making a decision about saving or investing money. Health: A constant conflict between the mind and heart is disturbing your general health. Let go of some emotions to feel a bit better. Past: In the past, you might have been pushed into such a situation where taking no decision led to a bad experience. Sometimes sitting quietly without any sign of activity is a sane option. Present: Stop the habit of putting off things just because your mind is not able to decide on one thing. If you go on shying away from life, in return nothing will be gained. Future: In the coming future, there would be more problems and tackling them a bit more challenging. So change your attitude before it’s too late.